A concerning gap exists between veterans who need behavioral health services and those who actually receive them. Notably, a congressionally-mandated study found that nearly half of all post-9/11 veterans with mental health conditions remain untreated today. It’s one of many research-backed statistics that point to growing and unmet behavioral health needs within the veteran population. Although quality care exists, the reality is that veterans are often unable to access services or do not seek them out. The congressional study uncovered numerous challenges that contribute to this current state of affairs, including stigma, self-shame, lack of understanding about treatment options, long wait times and logistical problems, such as transportation. In response, the U.S. government is investing notable resources into programs aimed at improving this outlook. Evidence shows the positive impact of telepsychiatry models as an effective and preferred solution for closing care gaps and improving veteran utilization of services. In fact, one study of over 98,000 users suggested that telehealth has “revolutionized mental healthcare delivery” within the VA and improved mental health outcomes by close to 25%. More than 700,000 veterans accessed care via telehealth in 2017, expanding adoption of this delivery model and underscoring both its effectiveness and necessity in addressing common barriers to care. Telepsychiatry has been proven successful for treating post-traumatic stress disorder (PTSD)—the most prevalent mental health diagnosis among veterans, impacting nearly 20%. A recent study published in Behaviour Research and Therapy found that PTSD treatment delivered via in-home telehealth has the same level of effectiveness as in-person therapy. In addition, a 2015 clinical trial found that telehealth-based collaborative care can successfully engage veteran populations in even the most extreme circumstances. Rural veterans who comprised the study sample were characterized as resistant to treatment and having high levels of PTSD severity, numerous comorbidities and poor health-related quality of life. Those who received telehealth services had significantly larger decreases in Posttraumatic Diagnostic Scale scores than those receiving care via traditional approaches. Telepsychiatry empowers veterans and their caregivers to seek out convenient ways of receiving care for these and other common conditions—such as substance use and traumatic brain injury—and addresses many existing challenges. With direct-to-consumer models of telepsychiatry, veterans and behavioral health providers are able to connect across geographies and outside the confines of traditional office hours via videoconferencing sessions, allowing patients to stay in the safety net of home or other private locations. 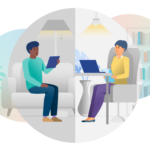 This framework promotes trust and a greater willingness to open up, as well as provides telepsychiatry providers with greater visibility and insights into an individual’s home environment and living conditions. There is good news for today’s veterans as the VA prioritized the improvement of veterans’ overall wellness as one of its top goals through 2020—behavioral health being a key part of that strategy. In 2017, VA telehealth options were significantly expanded as the U.S. government continues to acknowledge the importance of these resources. The expansion—made possible through the Veterans E-Health and Telemedicine Support (VETS) Act of 2017—authorized VA providers using telehealth technologies to serve veterans from any location in the U.S. Previously, telehealth services could only be delivered by providers in a VA facility, limiting provider choice and access, especially in rural areas where resources are limited. This new “Anywhere to Anywhere VA Health Care” initiative empowers the VA to bring more telepsychiatry providers into the network. Those telepsychiatry providers can then be connected with veterans living in remote areas that lack sufficient provider services. The act also enabled the expansion of the VA Community Care, which allows veterans access to care options outside of a VA facility, meaning that veterans can access care from a non-VA clinic in their community that uses telepsychiatry, or access telepsychiatry from a telepsychiatry provider directly from home. Outside of existing telehealth programs, these developments allow the VA to offer expanded care options for veterans. Forward-thinking Veterans Integrated Service Networks are exploring such opportunities by working with telepsychiatry providers outside of the VA system to expand their network of available providers. For today’s veterans, this continued push to expanded telepsychiatry networks and access is a positive step towards better behavioral health. Geoffrey Boyce is the chief executive officer of InSight Telepsychiatry, a national telepsychiatry organization with a mission to transform access to care.